Okay, I'm calling it right now. Someone needs to come and take my bottle of Autumn People away from me ASAP. I can. not. stop. layering it with all the polish I own! Well, if I liked it over the ah-mazing green jelly that is Stopped Watch, I'm drooooooling over this. I can't even describe how many just awesome things are going on in this layering. And I apologize that my photos don't quite do this justice. I'm wondering if it's my camera? Also... I might have gone a little bit overboard with the caffeine while nanowrimoing, so... sorrynotsorry. Bringing it back, I promise. 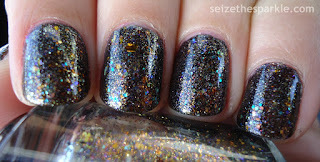 Wicked is actually a polish from Hard Candy's line prior to the current cylindrical bottles. You know, the square bottles with white caps? I honestly do regret that I didn't purchase more of this when I had the chance. But I'm superglad to own the ones that I have. 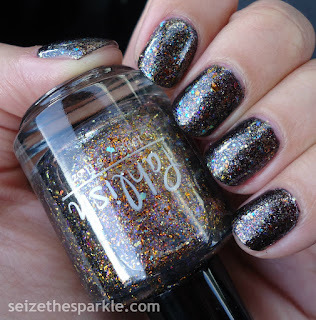 Wicked is a black creme polish packed with superfine silver shimmer. I want to say that I've worn it before, but I'm really not sure that I have. On top of that, I added Zoya Binx, which was fresh in my mind from the last Fishbowl Friday. 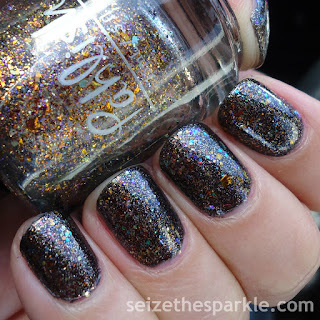 There's just something magical about opalescent glitter over dark blues and blacks. But I couldn't stop there! 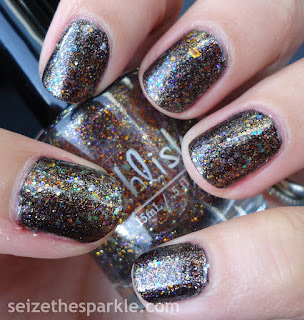 Next, I added a coat of Autumn People from Pahlish, one of just two multichrome flaky polishes in my collection. There's so much sparkly goodness on my nails right now... I'm seriously in love! I've had this layering on for the past two days, and I'm reluctant to take it off tonight. One, because I obviously love it. Also, I'm really glad I went down to nubs for this. Two, I am a little bit behind on my word count. I'm hoping to remedy that tonight. While everything about nubs and black polish feels right, wet nails and typing generally just do not go.